What causes this effect? Burmester Audiosystems identified after some basic research a noise component in the power supply that is solely responsible for the sound deterioration. We measured a miniscule direct current of a few millivolts in the AC voltage. Not only was this DC component not supposed to be there it also varied it’s strength over time. As it increased the sound of the system got worse. Available line filters did nothing to deal with this kind of line pollution. This is too bad because a few millivolts of DC are enough to drive amp transformers of any brand to the saturation point which becomes audible as transformer hum. As is widely known, the purebred transformers of high end amplifiers are particularly susceptible to DC components in the power supply. The power conditioner 948 measures the mean value of the supply voltage and adjusts it to zero by putting additional load onto the larger half-wave. In other words it assures that the voltage drop in the system is identical for the positive and negative half of the wave cycle. Hence, transformers no longer have to cope with direct current and stop humming. 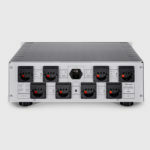 It is important to note that the power conditioner works in parallel with the connected audio components and thus avoids an undesirable damping of the voltage supply. This circuit logic is unique on the world market and has been patented by Burmester Audiosystems. Two additional RF filters to filter out parasytic RF noise for example from digital components or from tuners. These filters have a steep slope characteristic: -6dB at 2kHz, -20dB at 20kHz and already –60dB at 100 kHz! Hence, digital components or tuners should preferably be hooked up to outlets with RF filter. 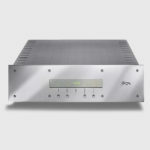 In all, eight audio components can be hooked up directly to the power conditioner. On all outlets and on the AC plug of the power conditioner the phase has been marked. Mass between the eight outlets has been star-connected. With Burmester's preamplifiers and D/A converters that have a variable output the outlets of the 948 can be remotely switched on and off.The display of the 948 indicates DC offset and voltage. The display can be switched off. 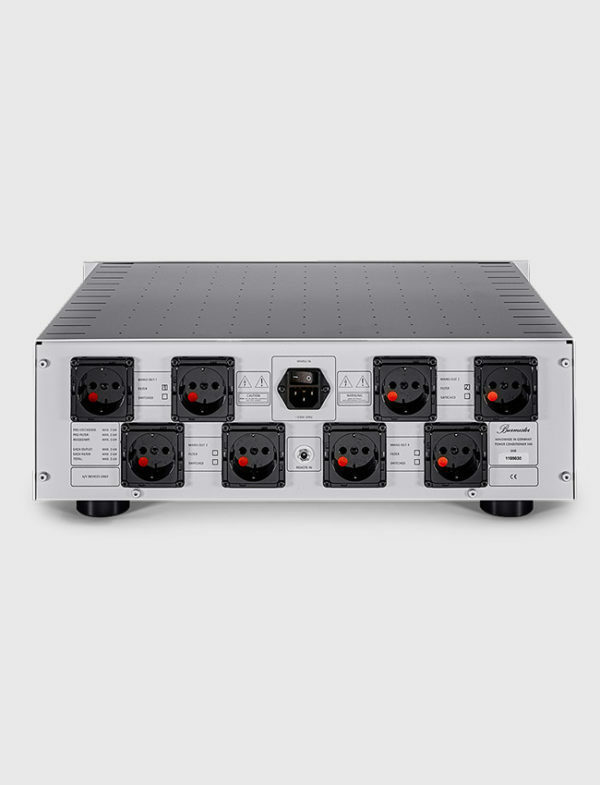 Burmester recommends connecting power amplifiers to the four outlets without RF noise filters. 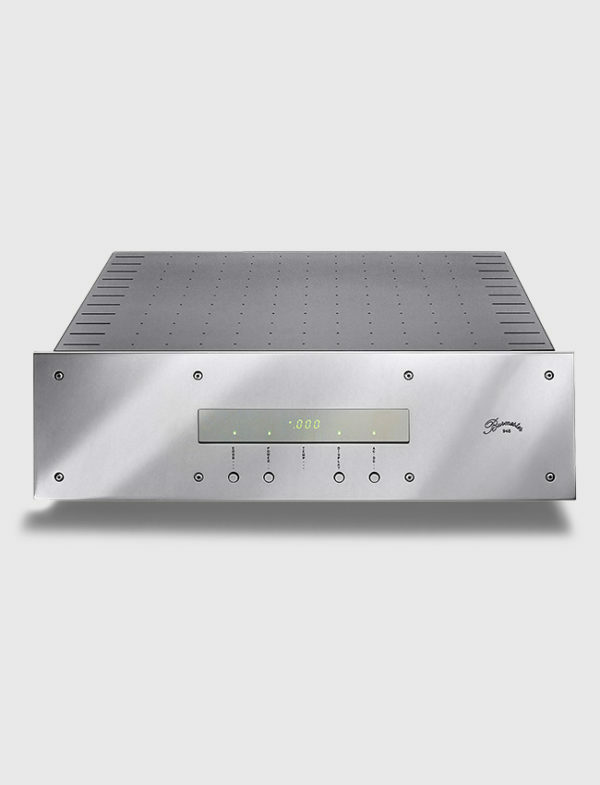 The appearance of the Power Conditioner with its chrome front panel follows the classical design of Burmester components. However, its larger dimensions point to the special place that the 948 occupies within the Burmester lineup. The display, which may be switched off, shows alternately current voltage or DC component. Four green LEDs signal the operating status. The complex monitoring and protection circuitry is brought to life by hand assembly in the Berlin factory. It protects valuable high-end audio systems from turbulences on the power grid. The back panel offers eight high-class AC outlets in a multipoint star configuration, making the 948 conditioner the ideal power hub for any valuable high-end system.